A simple, value-for-money PVC rain set for work conditions where severe wear occurs, such as paving, reinforcement and such. Waist trousers with elasticated waist, buttons for leg length adjustment. 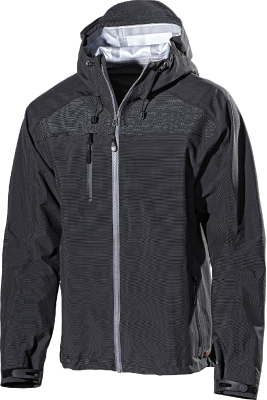 Waist-length rain jacket with permanent hood and lacing to adjust the hood opening. 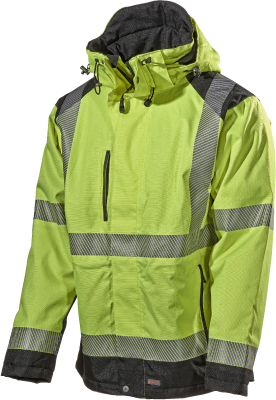 Zip and placket protexts the zip from wear and offers good protection against the wind. Water-tight with sewn and welded seams. Adjustable sleeve ends with press studs. Two side pockets with flaps and press studs. Material and weight: PVC. 380 g/m2. Certified to: EN 343, class 3 1.